Pearl Bay Villas is one of the best properties listed in Cyprus44 property reviews. Evergreen Developments are taking on the opportunities of the growing North Cyprus property market and creating their own portfolio of quality developments across the country. Their major site is at Crystal Bay, east of Kyrenia, where several developments merge onto one site, although this is sometimes tricky to tell from their brochures and web site. Pearl bay is a prime example, since it is not a separate development as such, but an extension of the main Crystal Bay development site. The Crystal Bay properties are closer to the sea, with the Pearl Bay properties behind them, but the Pearl Bay properties benefit from the rising slope as far as views are concerned. You have to drive past the Crystal Bay properties to reach Pearl Bay, but it’s the Pearl Bay area that has all the facilities, including the communal swimming pool and poolside café bar, gym and tennis court, a definite bonus! (Interestingly, these were only added to the plans in March 2007). And, of course, the beach is just metres away anyway. The Pearl Bay villas are unusual in that they not only have great views, but also offer the bonus feature of a basement living space - with windows. The sloping site allows Evergreen to develop a practical basement area that can either house a bedroom only, or be extended to accommodate the bedroom with ensuite bathroom and windows. This could be a lovely cool space during the heat of the North Cyprus summer months. The villa design is similar to that at Mountain Village and others sites, with a terrace covered with an arched pergola, and an upper sun terrace off the master bedroom. Certainly, it's an attractive design that will blend in more with its landscape than more modern designs, given time and some careful planting. In the type 303/303A villa type, the basement area is reached via stairs, and although it's not a big space, it is probably worth spending the money to have the 303A type villa with basement bedroom and bathroom and, to save a walk upstairs during the night or a dripping return from a shared shower in the morning! On the ground floor, the bedroom at the rear has its own ensuite bathroom, but the WC is accessed from the hallway, so it can be use without walking through a bedroom. The living and kitchen areas are open plan, and lead onto a big terrace that is mostly shaded by the pergola. Upstairs consists of the master bedroom with access to those great views from the French doors leading to the sun terrace. Dual split type air conditioning is fitted in the living room and master bedroom as standard, and you have the usual range of fitted kitchen, wardrobes, ceramics tiles, all in a choice of colours for that personal touch. Model 303A also includes your white goods, including a washing machine and a dryer - useful for all those kids' wet clothes - and air conditioning in all bedrooms. Pearl Bay villas offer a lot of features in a smaller space, with the benefit of those hillside views. With the communal pool just a short walk away, this could be an ideal investment property in North Cyprus for the family holiday rental market. Pearl Bay offers both the privacy of your own villa, and the community facilities where kids and parents alike can make new friends. 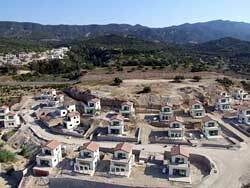 Pearl Bay in Northern Cyprus had just 23 villas on offer, and at time of writing only one remains unsold. Resale opportunities may arise, so it is worth contacting Evergreen for further details, or sign up for their newsletter. If you wish to let your North Cyprus investment property at Pearl Bay, there is an onsite letting and management office to help you. Romance with Pearl -Valentines Night!!!! PEARL! Thanks for your fine music and the great night! "Pearl"-Live at "The Black Olive Cafe Alsancak"
Thank you "Washerman and Pearl"
Big Thank You To Pearl!! This web page is served on 20 April 2019 at 00:09:33.